So it must be time to start dusting off those ideas and concepts for lessons and activities for the upcoming school year. I want this to be an interactive post, so I hope I get lots of responses from loyal readers and newcomers alike. I'd like to know, what are one or two ideas that you have -- whether you've brainstormed them yourself or read about them somewhere else -- that you can't wait to implement in the 09/10 school year. Here are two ideas that I want to try. I know that I read about them online, and I am very sorry to say that I cannot remember WHERE I read them so as to give credit where credit is due. 1) Making clocks that have some other pattern than counting by 1s. This could especially be used in conjunction with multiplication lessons, where instead of a clock reading 1-12, the numbers could be replaced with multiples of say, 4, so that it read 4,8,12...all the way to 48. I think that this would reinforce the multiplication concepts, certainly, but also give the kids a stronger understanding of the way to read an analog clock. 2) I want to have the kids write their own little story that explains a math procedure. For instance, when I talk about regrouping in subtraction -- borrowing -- I tell a little story as I go, about how the 2 can't subtract a 7, so he has to go next door and borrow one from his neighbor, OH, but the neighbor is a zero, so the ZERO has to go next door to borrow one from HIS neighbor... and so on, and so on. Maybe, with some work, the kids could write their own cute little way to remember how to borrow, or how to round, or how to put the correct quantity on top of the fraction. There are a couple of things that I want to try. Now you jump in, and tell us all about things that YOU are looking forward to giving a shot. Anyone else out there feel like summer break just isn't long enough? (Don't let non-teachers hear us saying things like that). It's plenty long enough, realistically. However, we are down to our last 3 weeks here in Dallas, and I feel like there are still so many "projects" I have yet to accomplish! I haven't done a YouTube video in forever, I have some artsy-fartsy crafts to do, and I have hardly worked on my Learn Me Good sequel (Learn Me Gooder?) at all! Thursday, Friday, and Saturday (yes, Saturday!!) of this week, I attended a professional development class. I was pretty disappointed that I really didn't get much out of it, other than a headache from walking between 104 degrees outside and 59 degrees inside AND a chance to read lots of my book during the lengthy and frequent downtimes. But one of the things that was discussed was a bit puzzling to me, so I wanted to throw it up here (not in the vomit sense) for debate. The issue was of Ability Grouping. The speaker was obviously against ability grouping. He said that in the past, some people have put the high kids together in one class and the lower kids together in another class. In this situation, the low kids tend to learn a lot and the high kids learn a lot, but the gap between their knowledge grows even wider. Whereas in a mixed-ability group, the high kids will pull the lower kids up, and so the knowledge gap is decreased. What I'm wondering is, is our goal here really to shrink the knowledge gap, or is our goal to teach every kid as much as possible? And is it really better to have a smaller gap at the end of the year, where the high kids have increased, let's say, 10% and the low kids have increased, let's say, 30%, OR is it better at the end of the year to have high kids that have increased by 50% and low kids that have increased by 50%? Several years ago, my partner and I did group our kids as such. I felt that it was successful because I could go at a different pace with each group, and not feel like anyone was being left behind. However, I can also see the merits of letting the high kids become more "teacherly" in helping the lower kids. Hey all, I'd like to make a request that can really help my book, Learn Me Good, get more exposure. This doesn't cost you a thing and it will take roughly 5 seconds of your time. The more times a book is tagged with a certain category, ie, "humor," the higher it will rise in the visibility for readers to see when they look at that category. I would be eternally grateful if you could go to the Amazon page for Learn Me Good -- then just find the section that says "Tags Customers Associate with this Product" and click the boxes next to "humor," "education," and "teaching." That's it! Thank you very much to everyone who does this!! My gf and I took a week's vacation up to the northeastern part of this grand country of ours. Boston and New York, to be more specific. 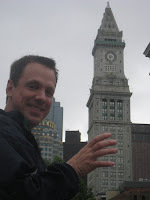 I had been to Boston before; back when I was an engineer, my clients were based around Boston. But I had never been to visit or tour or sight see. And I had never been to Manhattan. It was all freakin' awesome (wicked awesome, even). Though I am INCREDIBLY tired and sore. It was not a relaxing vacation where we just laid around and dozed by any means. No, we aggressively toured each site, packing just a bout everything humanly possible into those few days. 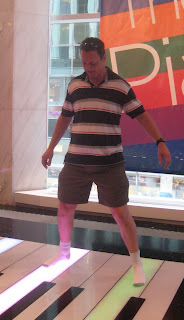 We walked miles and miles, took bus tours, trolley tours, subway tours, ferry tours. We walked the entire Freedom Trail in Boston and traversed Central Park several times. 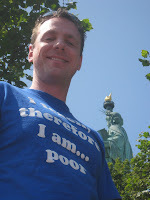 Saw the view from the Empire State Building and saw the Statue of Liberty from Liberty Island. I took like 600 some pictures (I'll only post 2 or 3 here). We saw the Letterman show (the one that will air tomorrow night with Tom Arnold), and I shook Rupert Jhee's hand in the Hello Deli. I brought a copy of Learn Me Good for Dave, on the infinitesimal chance that we might be in the front row AND that he might come out into the audience, AND that I might be able to hand it to him. That of course did not happen, so I did the next best thing -- I walked between the lions and donated that copy to the New York Public Library. Now whenever I watch the beginning of Ghostbusters, I will know that I have a book in those hallowed halls. Flew home yesterday, visited the chiropractor, and then got up early this morning to begin my 3-day dual-language training institute. Know anyone who has an Amazon Kindle? If so, please point them towards Learn Me Good, the Kindle edition, which is currently available for the bargain basement price of one dollar! I've also recently made Learn Me Good available electronically in all sorts of formats for a nice low price at Smashwords, so check it out! My thanks go out to Amber today for sending me a link to a post at Teaching Degree, titled "Comics in the Classroom: 100 Tips, Tools, and Resources for Teachers." There are (as promised) one hundred links, including everything from articles about the benefits of using comics, to lesson plans, to permission pages to print comic strips! Check it out! You just might learn something! As most of you probably know, my good friend Joel, over at So You Want to Teach? is very, very (very times a million) fond of lists. That fact, combined with the fact that I am running low on things to blog about have merged to fit this blog post. A couple of days ago, Joel wrote a post called "10 things you can do to spend less money this summer." I thought to myself, "Self, since there is a conspicuous absence of Olympic Games this summer, let's come up with our OWN competition. Let's one-up one of Joel's lists!" And with that compelling argument from Self, I had no choice but to do this. Joel's post is great, it lists 10 cheap things to do over the next few months. 1) Rewatch your favorite movies from your own DVD collection in the comfort of your own home. Repeat until you can write the entire script from memory. 2) Learn a new skill that requires nothing but items from around the house. Juggling might take you the whole summer to learn. Once mastered, try calligraphy, then daguerrotyping. 3) Tackle Pi. Keep a running record of the pesky number, adding on at least 4 decimal places every day. 3.14159 -- that should get you started. 4) Keep a tape recorder by your phone and record calls from telemarketers. Try to be as ridiculous and absurd as you can. See how long you can keep them on the line. 5) Save on food costs by introducing yourself to new neighbors. Knock on their door and say, "Hi there! I'm (insert your name here)! Nice to meet you! Something smells great -- what are we having for dinner??" 6) When you DO go grocery shopping, stick to the dollar stores. They sell food now! Believe me, a one dollar steak tastes exactly as good as you would think! 7) Make those expensive drinks last longer! When you feel like orange juice, coke, or even tequila, stretch out that bottle by adding water to your glass. I recommend 14 parts water, 1 part drink of choice. 8) Forget expensive vacations to faraway locales! Take a local tour that will run you only the price of gas (even better --ride a bike!). Be sure to bring your camera so you can take pictures to remember things such as your neighbor's foot-tall weed, the incredible barking dog, and the unforgettable "Truck parked across two spots at the 7-11." 9) Summer is a great time to catch up on reading, but don't go out and BUY any books. Just make a daily trip to your local bookstore and sit for a few hours, reading all the new novels. Pretty soon, the staff will recognize you as a regular. They love it when people do that. 10) Ditch the hired help when it comes to lawn maintenance. In fact, don't spend time or money on a lawn mower or any other pricey equipment. Just go out and get a goat! Once you're past the initial investment (cheaper if you can score an aging high school mascot), there will be no more expenses, and your lawn will be the best chewed on the block. 11) Hours of absolutely free entertainment can be had by plunking yourself down on YouTube. See the freaky dancing toddler, Bret Michaels getting busted in the face, and of course Professor Darth Vader. And there's the list. Again, thanks and apologies in advance to Joel. Check out his list, and you'll have a Blackjack of ideas.